But Who Cares For The Care Quality Commission? There is a popular model of mistake-making in medicine known as the ‘Swiss Cheese’. 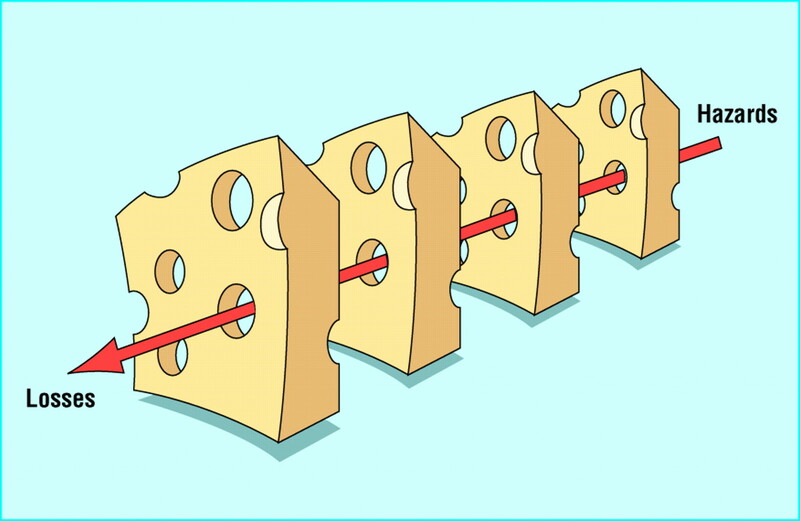 We know patients that come to an adverse outcome pass through many opportunities to correct or avoid an error- this cumulatively leads, through all the holes in all the layers of the cheese, to death or major harm. This reflects the complex interplay of many factors; between patient and staff, between staff, between systems and people and even between systems. Health professionals recognise this: we can all think of instances where a single missed outpatient appointment, omitting a single tablet or even just being in the wrong place at the wrong time led to catastrophic consequences- the importance of that pivotal moment only apparent in retrospect. The belief that hospitals are closed or dangerous on the weekend has reportedly been leading patients to avoid or delay seeking treatment for fear of dying, and likely causing widespread harm. This has been dubbed the ‘Hunt Effect’. For now the patients remain rightly confidential- but efforts are underway to collect their stories. The seemingly small perception that weekends are not well staffed in the NHS is leading to catastrophic harm: loss of vision and paralysis are two tragic examples quoted so far. Efforts are under way to collect more information, if you have a case add it here. I’m glad this ‘Hunt Effect’ is gaining traction in the mainstream press- it is a very real attitude we are encountering on a daily basis. However, this isn’t just a phenomenon unique to the failed marmalade salesman  , Mr Hunt, and we shouldn’t forget it. The ‘Hunt Effect’ is the first time people have tried to objectively document harm arising from the irresponsibility of media outlets and politicians in discussing and reporting on health. The Daily Mail and other tabloid newspapers routinely inflate stories like this with headlines such as ‘[nearly anything] gives you Cancer’ [Daily Mail- 3] , ‘GPs who miss cancer should be named and shamed (another Hunt Effect)’ [4,5], and more recently: ‘Consultants STILL won’t work weekends‘ . I’ve proposed trying to work out the harm these stories create before*. When it gets into party politics it gets much worse than the newspapers. It becomes endless. Political statements get beaten into every interview and speech by MPs and party members and ‘Independent’ talking heads for hire (e.g. Taxpayers Alliance) over and over again. It creates a lasting grubby aura of an idea, like a toothpaste stain that just can’t wash out. The ‘Hunt Effect’ is the latest in a long history of dangerous misconceptions – unintended consequences perhaps, but quantifiable harm nonetheless. We are not quite in Wakefield/MMR territory yet, but it’s on its way. This is a great illustration of what happens when a Health Secretary likes to play loose with the facts. 2) even if one imagines there is- on the most contrived scale that I must stress is in no way evidenced to be attributable- the extra risk of death that Jeremy hunt has banged on about is 0.07%. (11,000/14,500,000). 3) the hospital is fully staffed for all emergencies 24/7. That’s what emergency means. But if you want to create the illusion a change is necessary, you need to create the illusion there is danger. However if you try to influence a patient’s health beliefs you will also influence their behaviour, and harm occurs as a consequence. ‘The Hunt Effect’ should be subtitled ‘What Happens When the Health Secretary is an Inflammatory Moron’. The reason that ‘The Hunt Effect’ has gained such legs is because it has been said unchallenged in so many news outlets. It has permeated the cultural ether of what is ‘known’. There are two reasons why doctors aren’t challenging this effectively. 1) We are being overly polite- we are treating this like dealing with an angry relative, calm and professionally, when we should universally be openly damning of what is an idiotic interpretation of the data. For those of you who haven’t got a handle on it yet: here and here. 2) Deep down we all believe that there IS a worse service on the weekends. The BMA has said this for years- but it’s got nothing to do with doctors or nurses being unavailable. If we had the whole hospital at our finger tips, radiology, biochemistry, porters, phlebotomy, we could give our patients the best care possible. But we can’t do that without funding, and we can’t do that with burnt out staff. And when money is tight we should be efficient with our priorities- keep elective work to the weekdays, concentrate resources while we figure out how to manage the sickest patients first, with the rising demand and decreasing money we already have. So from now on, when you hear this ‘weekends’ are dangerous’ lie- call it out and challenge what it is. This is propaganda to dismantle the NHS and it is already hurting real people. Hunt has already broken patients confidentiality, now he is actually harming them as well. Any doctor that did the same would be in prison right now. Protect our patients, protect our NHS, from the failed marmalade salesman, the Right Honourable Jeremy Hunt. * (from original post  June 2014) If you are interested, here is how I propose we investigate irresponsible health journalism; All health stories in major newspapers (Especially the Daily Mail) from the past ten years regarding health topics are identified, scrutinised for their accuracy against the scientific data available, and then calculated how inaccurate they are qualitatively on a scale of 1 to 5, 1 being minor inaccuracies (e.g. misspelling a name) to 5 being major inaccuracies causing potential harm (e.g. reporting an unsubstantiated conclusion and recommending a change in the behaviour of the individual that could result in disease e.g. Avoiding vaccinations). The impact of the story is then calculated by the potential harm, the readership, and the prevalence of the outcome. An excess death figure is calculated based on this. E.g. reporting vaccinations cause autism, calculating the drop in vaccination as per the readership and then the prevalence of new cases of measles for example and excess death. I appreciate this would be nearly impossible, but this is an exercise in imaginary science. Then, based on this, we could Name and Shame the greatest offenders and the relative risk of reading each paper on the individuals health. By law, this would have to printed on the front of each newspaper under a Health Warning label. I hadn’t thought of it like that before, but you’re right; great analogy.